Art can be found in surprising places around Paris. In this month’s Paris Insights, Monique Y. 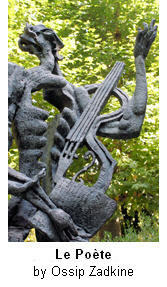 Wells explores four works by Ossip Zadkine (1890-1967), a Russian immigrant who arrived in Paris in 1909, and who was one of the many artists, both foreign and local, who contributed to the artistic movement that became known as the Ecole de Paris.